Admission is Pay-What-You-Can. Please contact Liza at foh@theatrenorthwest.com to find out more info and to RSVP!!! An incredibly powerful and accessible play about the collateral damage of the Residential School system in Canada that is currently preparing for a world tour. Having TNW premiere this piece is a very exciting venture for us. In this moving play Brandon White is a half white, half Ojibway Canadian that believes in the conservative government and thinks he has all the answers, understanding ‘both sides of the coin’! But when Indian Affairs sends him on a job to discredit a Residential School survivor Brandon is thrown into a world that challenges everything he has ever believed in! Watch as this one person show mesmerizes with its exciting and innovative technical presentation and its powerful and forward thinking message of togetherness and hope. 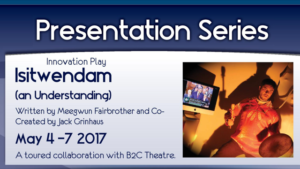 This early development presentation will include talks and feedback sessions with audiences post the workshop presentation! !